Along with writing The Doctor’s Monsters, I’ve also been editing a book of papers on the Russell T Davies era of Doctor Who, along with Simon Bradshaw and Antony Keen. It’s being published early next year by the Science Fiction Foundation, and as you can see has a wonderful cover by Pete Young. We’ve also just received a Foreword for the book by Robert Shearman, author of “Dalek” among much else. Once we’ve fixed the price and so on, I’ll post details of how to order the book here. In the meantime, the blurb and contributor list is below. The return of Doctor Who to regular TV production after many years of absence has proven to be one of the BBC’s greatest successes of the last decade. To a great extent this is down to the distinctive re-invention of the programme by its chief writer and executive producer, Russell T. Davies, and the group of writers – many, like him, long-term Who fans – he assembled. 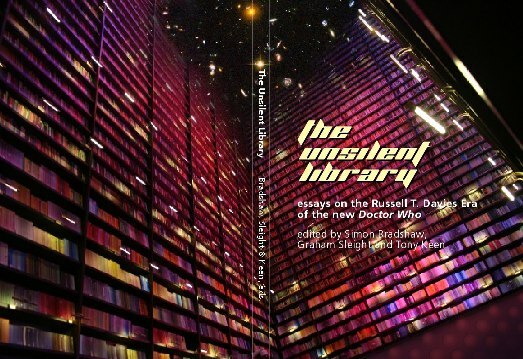 The Unsilent Library examines the storytelling style and techniques of the first five years of the New Doctor Who. Ten in-depth critical essays explore how its writers have updated a series with a history stretching back five decades to stand in the forefront of contemporary science fiction drama.